Israel is determined to keep fighting Lebanon-based Hezbollah and will take "severe measures" against the militant group's guerrillas, Israeli Prime Minister Ehud Olmert said Tuesday, signaling there will be no letup in Israel's two-week military offensive. 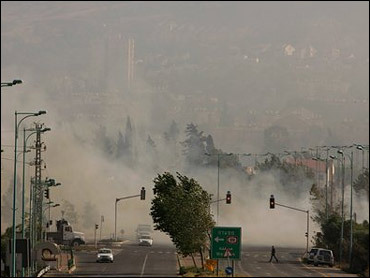 Hezbollah responded a few hours later - with more than a dozen rockets hitting the northern Israeli city of Haifa. Israeli media reports several people were injured. Witnesses say two rockets hit near Rambam Hospital. Olmert spoke at the start of a meeting with U.S. Secretary of State Condoleezza Rice, who called for a cease fire, but not at any price. "We need to ensure that we will not return to the previous situation," Rice said. Also Tuesday, a senior Israeli army commander made the military's first comment on the likely scope of the ground war in Lebanon. "The intention is to deal with the Hezbollah infrastructure that is within reach," said Livni, in an Israel Army Radio recap of the campaign to wipe out guerrilla outposts and rocket-launching sites. "That means in southern Lebanon, not going beyond that." Rice began her Mideast trip in Lebanon Monday, where she laid out the U.S. position during an unannounced visit to Beirut. Rice met first with Lebanese Prime Minister Fuad Saniora and Foreign Minister Fawzi Salloukh, and then hosted a dinner at the U.S. embassay for a group of anti-Syrian Lebanese politicians who call themselves the March 14 Forces. Rice is arguing for a cease fire simultaneous with the deployment of international and Lebanese troops into southern Lebanon, to prevent new Hezbollah attacks on Israel. CBS News chief foreign correspondent Lara Logan reports Lebanese officials describe Monday's meetings as tense, with Rice repeating the same conditions for a cease fire that Israel has laid out. Parliament speaker Nabih Berri, a prominent Shiite Muslim who has been negotiating on behalf of Hezbollah, rejected the idea and said a cease fire should be immediate, leaving the other issues for much later. Western-backed Prime Minister Fuad Saniora took a similar stance and complained to Rice about the destruction wreaked by U.S. ally Israel. Israel, the Lebanese leader told Rice, "is taking Lebanon backward 50 years and the result will be Lebanon's destruction." Hospital and security officials say seven people were killed and another person was wounded in an Israeli missile strike early Tuesday on a house in Nabatiyeh, in south Lebanon. Israeli troops Monday seized a hilltop in a Hezbollah stronghold, capturing two guerrillas in heavy fighting. The U.S. has evacuated 12,000 Americans. A group of 300 Americans and 100 other Europeans are believed to be trapped in villages south of Tyre, according to Erik Rattat, a German official involved in the evacuation of foreigners from Lebanon. Some 11,700 Americans have fled Lebanon. President Bush has ordered helicopters and ships to Lebanon to provide humanitarian aid. Announcing the assistance program, White House press secretary Tony Snow said there's no reason to believe an immediate cease fire would stop violence in the Mideast and said the world should confront the destabilizing force of Hezbollah and its practice of using the Lebanese people as "human shields." United Nations Secretary-General Kofi Annan said he wants a meeting Wednesday in Rome to negotiate a deal including a cease fire, deployment of an international force and the release of two Israeli soldiers abducted by Hezbollah. Annan's goal is "to keep the U.N. involved in the mediation efforts, even if the international military force is likely to be a NATO or other non-U.N. force," said CBS News foreign affairs analyst Pamela Falk. "Relief aid and humanitarian assistance will most likely have to be distributed by U.N. agencies." Hezbollah's representative in Iran warned Monday that his militant group plans to widen its attacks on Israel. "We are going to make Israel not safe for Israelis. There will be no place they are safe," Hossein Safiadeen told a conference that included the Tehran-based representative of the Palestinian group Hamas and the ambassadors from Lebanon, Syria and the Palestinian Authority. "You will see a new Middle East - in the way of Hezbollah and Islam, not in the way of Rice and Israel." Israel shelled a town in Beit Lahiya in the northern Gaza Strip on Monday, killing five Palestinians and wounding at least nine people, according to hospital officials. Israel said its attacks were aimed at two groups of Hamas militants firing rockets at southern Israel and that it regretted any civilian casualties. An Israeli helicopter crashed in northern Israel near the Lebanese border after hitting an electrical wire while making an emergency landing, causing two casualties and starting a large brushfire atop a hill. A day after criticizing Israel for "disproportionate" strikes against civilians, U.N. humanitarian chief Jan Egeland accused Hezbollah of "cowardly blending" among Lebanese civilians. "Consistently, from the Hezbollah heartland, my message was that Hezbollah must stop this cowardly blending... among women and children," Egeland said. "I heard they were proud because they lost very few fighters and that it was the civilians bearing the brunt of this. I don't think anyone should be proud of having many more children and women dead than armed men." Israel appeared to be easing bombardment in populated areas and roads in Lebanon that has killed hundreds, displaced as many as 750,000 and dismembered the transportation network. Instead, it appeared to be focusing its firepower on Hezbollah at the front. Beirut saw no strikes all Monday, in apparent deference to Rice's visit. CBS News correspondent Richard Roth reports Hezbollah's headquarters — its offices and apartments and even its streets — are all mostly just rubble now. But the infrastructure Hezbollah relies on isn't made of concrete and steel. Hezbollah's foundation is religious zeal and popular support, Roth reports. It is a surrogate government that runs clinics and schools and mosques — and is a part of the establishment with 14 seats in parliament. Israel's overall death toll stands at 39, with 17 people killed by Hezbollah rockets and 22 soldiers killed in the fighting. Sixty-eight soldiers have been wounded, and 255 civilians were injured by rocket fire, officials said. On the Lebanese side, security officials said 384 people had been killed, including 20 soldiers and 11 Hezbollah guerrillas. Israel continued pounding the visible infrastructure of Hezbollah in Lebanon on Monday. CBS News correspondent Lee Cowan reports from Tyre that the Lebanese didn't need a reminder of the danger but the Israelis gave them one anyway: High overhead, two explosions and leaflets filled the sky. The message fluttering down was as simple as it was cold. "This is just the beginning," it said. At the front, Israeli ground forces waged a fierce battle Monday with guerrillas dug in at the closest large town to the border, Bint Jbail, known as "the capital of the resistance" for its vehement support of Hezbollah during Israel's 1982-2000 occupation of the south. The army said it captured two Hezbollah guerrillas, the first time it has taken any into custody during the fighting. "When the enemy surrenders, we take them prisoner. The two prisoners are located in Israel and will be held here with the aim of interrogating them," said Brig. Gen. Alon Friedman. Backed by an intense artillery barrage, troops seized a hilltop inside the town, but the rest of Bint Jbail remained in the hands of up to 200 Hezbollah guerrillas, military officials said. Israeli military officials say several thousand troops are moving in and out of southern Lebanon, but there are less than that number in there at any one time. A day earlier, a Red Cross doctor visited Bint Jbail and reported an unknown number of families hunkered down in schools and mosques for protection, though much of the population of about 30,000 had fled. Bint Jbail holds a legendary reputation with Hezbollah, because it was one of three large towns inside Israel's buffer zone and backing for the guerrillas remained strong throughout the occupation. Signs in the town tout its nickname. When Israel withdrew from Lebanon in 2000, Hezbollah leader Sheik Hassan Nasrallah held a large celebration in Bint Jbail, proclaiming that the guerrillas now stood on Israel's border. The move into Bint Jbail, about 2.5 miles from the border, represents the spear point of Israel's advance, moving forward from Maroun al-Ras, a frontier village captured in more heavy fighting over the weekend. At the same time, Israeli forces were working to destroy every Hezbollah post within a half mile of the 40-mile Israeli-Lebanese border, Israeli Maj. Gen. Gadi Eizenkot said. The Israeli bombardment hit the southern cities of Tyre and Nabatiyeh. An Israeli shell crashed into a house near the Lebanese town of Marjayoun late Monday, wounding two children, witnesses said. Persistent bombardment of southern Beirut has made three hospitals there unusable because staff and supply can't reach them, forcing the evacuation of more than 50 patients. Hospitals in Tyre in Nabatiyeh are forced to take only emergency cases to preserve supplies. "Our situation is tragic. Hospitals across Lebanon are suffering medicine and fuel shortages," Lebanese Health Minister Jawad Khalife told The Associated Press. The Red Cross sent convoys to Tyre and Marjayoun bearing blankets, generators for hospitals, hygienic supplies and other materials. Egeland called on Israel to open the port of Tyre to let in aid ships and guarantee safe passage for relief convoys. An entry point at Tyre would get material directly into the south without a dangerous convoy drive. Two ships docked at Beirut and convoys entered from Syria, bearing blankets, food, medicine. Two convoys of trucks took material to the worst-hit areas in the south along dangerous and broken roads. Amer Daoudi, Emergency Coordinator for the World Food Program operations in Lebanon, said it is vital to move fast to get aid to the people who need it most. "We need to reach these people fast. It is bad enough that their lives have been shattered without them having to go hungry as well."